These changes would ensure the Q50's continued success in the entry-level luxury sedan segment. After a week in the Infiniti Q50 S 3.0t we came away with a few ideas for how the sedan could be improved. The goal of these improvements wouldn’t be for the Q50 to take down the BMW 3 Series or Mercedes-Benz C-Class in the sales race. Rather, they’d be designed to give the sedan a lasting appeal that would lead to more robust sales and a firmer grip on its current third-place sales position. The segment is ultra-competitive, but we believe the Q50 is well placed to gobble up more sales from the also-rans. Improvement 1 – Offer a top-tier performance model: Yes, we know the Q50 Red Sport 400 exists. But no one speaks of it in the same sentence as the M3 or the Mercedes-AMG C43 or C63 sedans, and that's by design. If Infiniti wants lasting staying power for the Q50 it needs to offer a top-tier performance trim to cast a halo over the entire model lineup. How about running the numbers again and seeing if something like the Q50 Eau Rogue makes sense? The Q50 Eau Rogue would give Infiniti a legit competitor to the M3 and AMG C63 sedan thanks to the Nissan GT-R engine under its hood. The automaker is coming off a record sales year which hopefully means more money to invest in projects like this one. Improvement 2 – Open up the options list: One issue we had with our tester is that it felt overpriced at $52,420. This problem could be easily solved with an expanded options list. Infiniti needs to get with the program and offer smaller and cheaper packages to allow consumers to get things like heated front seats and a heated steering wheel for cheaper than $2,250, the current cost of the Premium Plus Package these features are included in. Same for quilted leather seats which currently live in the $1,850 Design Package. The Q50 offers awesome standard features, including a dual-screen infotainment center (we'd prefer just one screen) and dual-zone climate control, but it needs to give more options to buyers on the top end of the pricing spectrum. Improvement 3 – Improve the gas mileage of the twin-turbo V6: The Variable Compression Turbo, or VC-T, engine is on its way and should land in models sometime in 2018. However, Infiniti still needs to improve the dismal fuel economy of its Q50s powered by the 3.0-liter twin-turbo V6. ISS, or Idle Stop Start, is offered on 2.0-liter turbo-four models and could help the V6 at the pump, especially since cylinder deactivation doesn't seem like a realistic option at the moment. The bottom line is that Infiniti needs to do something as 20 mpg combined—which is what we averaged in the AWD Q50 3.0t Sport—is terrible. 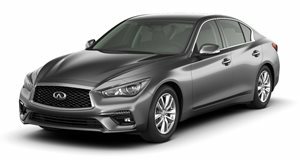 Improvement 4 – Figure out the Q50’s identity: We ended our review of the Q50 by saying that it was a car grasping for an identity. Infiniti’s product planners would be smart to figure out what that identity is. Currently the Q50 does a lot of things well but fails to stand out in any real way. If the model is going to have any staying power in the competitive entry-level luxury sedan it’ll need to be known for something, whether that’s sportiness, standard features, luxury, tech, affordability, or something else.